‘Marvel: Ultimate Alliance 2’ started shipping today. The sequel to ‘Marvel: Ultimate Alliance’ comes from Activision and continues to follow Marvel’s Civil War storyline. Players assemble four-character teams, and for the first time will be able to fuse two character’s powers into one. The game will allow over 250 fusions of super hero powers, for example a combination of Human Torch and Storm, or Wolverine and Iron Man. 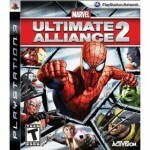 ‘Ultimate Alliance 2’ allows individual play or multiplayer co-op mode, and lets you select from 24 heroes and villains. “Players will fight through cinematic and immersive environments, engage in graphically vivid and devastating fusions, and interact with or destroy everything in their path as they experience one of the most tumultuous political events ever imagined in comic book lore,” said Activision’s Rob Kostich. ‘Marvel Ultimate Alliance 2’ is available for Xbox 360, PS3, Wii, , Nintendo, Nintendo DS, PS2 and PSP.